The lodge is accessible only via snowmobile in the winter - or you may arrange to have us pick you up in our tracked Yukon! Cornucopia Lodge is ideally located in the southern part of Oregon's Wallowa-Whitman National Forest. The terrain ranges from tree-covered slopes to alpine meadows, ridges, and peaks with magnificent views. Look out over the towns in the valley below, gaze at the glistening summits of Eagle Cap Wilderness or spot the Seven Devil mountain range across Hells Canyon in Idaho! Step out of your lodge room or cabin and onto your snowmobile, ready to ride the 287 miles of mostly groomed trail just waiting for you where the average annual snowfall is 300 inches. Bring your snowmobile, friends, and family. Have a great time staying in a mountain lodge instead of a noisy downtown motel. 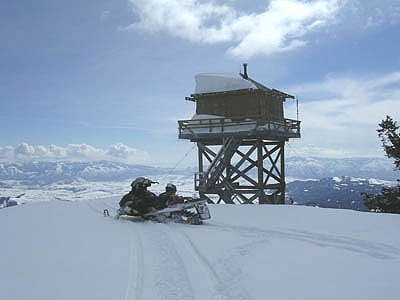 You'll be a short six miles from some of the finest snowmobile routes in the West. The trails can take you all the way from Halfway to Joseph, Oregon, a very popular 60 mile ride. Visit one of the nearby play areas or one of the points overlooking Hells Canyon. Start the day with a hearty breakfast, take a sack lunch for the trail, and when you return, there will be a delicious family-style meal waiting for you. It just doesn't get any better than Cornucopia snowmobiling. Be sure and follow our Cornucopia Trails facebook page for all the latest trail and snow updates! The world famous southern Wallowa Mountains are known for abundant snowfall, with seasonal snowfall totals often exceeding 500 inches. Self-guided ski tours start from the front door of your cabin and skiers of all interest and ability levels can find suitable terrain. Immediately next to the lodge, skiers can find open glades, steep tree skiing, and relaxing Nordic tours. Just a little further up the skin track, are alpine powder fields, and numerous cirques and bowls. For the most adventurous backcountry travelers, ski mountaineering objectives and alpine tours into the highest of the Wallowa mountains are available. Enjoy easy snowmobile accessed terrain, or the tranquility of the non-motorized. The best part of the Eagle Cap Wilderness is the lack of crowds! The southern Wallowas are the best-kept secret of the Pacific Northwest. You are unlikely to encounter other skiers, and should have the slopes all to yourself. For more information, give us a call. AND.. be sure and follow our Cornucopia Trails facebook page for all the latest trail and snow updates! Cornucopia is the perfect place for your Holiday party! With the amazing snow, mountains and views, our mountain lodge is the very definition of Christmas. We can accommodate your group of up to 30. For dates after the road is closed due to snow, we do have transportation for a limited number, via our tracked SUV. Just looking for some quiet solitude? We're the place for you! If you need transportation up the mountain, we can do that with our tracked SUV (small fee applies). Bring your pet, your spouse, your friend or just come alone. You can enjoy skiing, snowshoeing or just relax and enjoy the beauty.